from A Muse - A Visit to the Studio of Varujan Boghosian, 2011, Leather or cloth clamshell box containing 18 Archival Pigment Prints on Hahnemuhle German Etching 80 lb. paper with accompanying texts. Edition of 18. 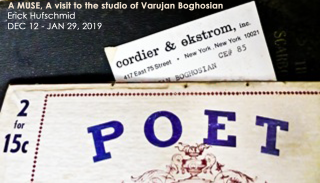 "This portfolio of photographs were taken by Erick Hufschmid in the spring of 2011, of the studio of Varujan Boghosian (born 1926), located on the campus of Dartmouth College in Hanover, New Hampshire. The photographs are of the studio as found, that is, nothing has been arranged, altered, moved, or changed in any way, from the studio as Hufschmid encountered it. 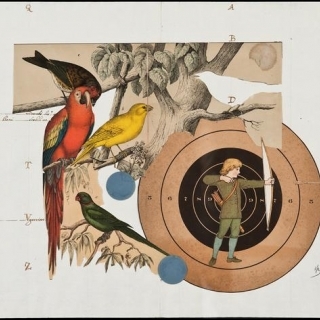 The portfolio’s release is timed to coincide with the solo exhibition of Boghosian’s recent collages showing in the main gallery of BigTown Gallery, Rochester, Vermont from July13, through August 21, 2011. "The surfaces of things speak of histories, small incursions into the lives of others. Eliot's time past and time future, what might have been and what has been point to one end, which is always present. Time's caress erodes and abrades softly or takes abruptly a limb or body—leaving behind only a doll's small shoes or the head of an artist's mannequin. Or a love letter, a keepsake. Objects, now past the age of youth, lead down a tunnel of rapidly disappearing traces of their presence, each tiny door the gateway to a moment no longer retrievable. Here are evocations of those who have gone before—children hugging dolls, playing with toy cars. Women clutching fans or assembling quilts with pearled pins. 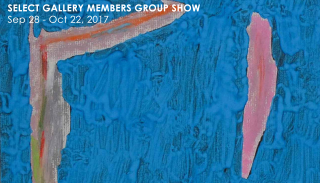 "Poets collect unusual words and images in hope that their proximity to each other may generate a new set of associations. Artists collect things other people have discarded or never truly noticed. “The materials dictate what I do,” Boghosian told me. The clutter in his studio has the look of a flea market or a garage sale, until one begins to notice the exquisiteness and strangeness of each individual item he has collected. Among them one finds childrens’ playing blocks, hands that may have belonged to statues, pearl-headed millinery pins, door bells, old tools, store signs, ancient playing cards, and hundreds of other items once intended for other uses. They are battered, rusty, stained, weathered and peeling. One would not be surprised to encounter a scarf Isadora Duncan strangled herself with, still tied to one of the wooden wheels. A combination of accident and luck may have brought them to his studio, but now their adventure really begins. They are about to have an exciting new life in one of his constructions or collages. From a ripped and soiled industrial apron of heavy material that a welder in a factory might have used, a wooden hand sticks out of a pocket holding a small brightly-colored clarinet made of wood, while a vicious looking rattle snake hangs out of the huge rips on its side.